As we’ve known since early September, today Singapore Airlines had a media launch event for their new A380. As part of this, Singapore Airlines is unveiling new Suites, business, premium economy, and economy products. While there have been leaks over the past few days about Singapore’s new A380 Suites, we haven’t seen anything about their new business class. The relaxed and contemporary setting in Business Class is enhanced by a stylish combination of padded bed sheets, blankets as well as a larger pillow. These soft furnishings provide a relaxed atmosphere on board, bringing greater comfort for customers as they work or unwind during the flight. Business Class customers can look forward to a pampering treat, with a range of Penhaligon’s washroom amenities available on board such as hand lotion, facial mist and fragrance. In the Business Class cabin, customers can look forward to an even more refined service and dining experience with all meals served on Narumi-designed chinaware. Coupled with Singapore Airlines’ world-class service, customers will enjoy a truly delightful experience as they wine and dine on board. 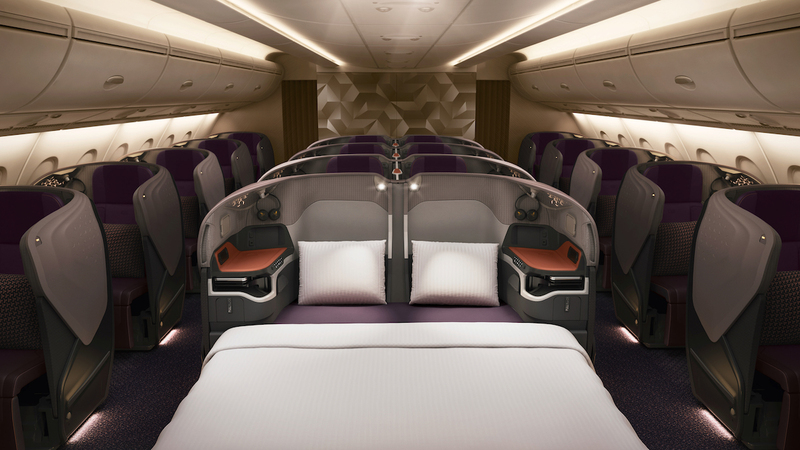 Which routes will have Singapore’s new A380 Business class? The first planes to get these new business class seats will be the five A380s that Singapore Airlines is taking delivery of over the next couple of years. 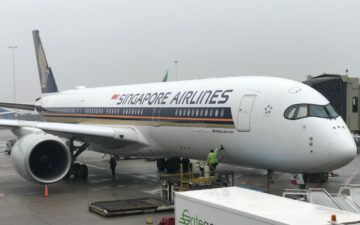 The first route to get the Suites will be Singapore to Sydney on SQ221/232 as of December 18, 2017, and we have reason to believe that London Heathrow will be the next destination to get them. On top of that, Singapore is reconfiguring their existing 14 A380s with this product, between late 2018 and 2020. What do I make of the new Singapore Business Class? While Singapore’s new Suites will make just about anyone say “wow,” their new business class is a different story. While I’ll have to try these seats myself, I’m not terribly impressed on the surface. We’ve seen Qatar Airways introduce Qsuites and Delta introduce their Delta One Suites, both of which feature doors, so I was fully expecting Singapore Airlines to introduce something that offers similar privacy. I’m a bit surprised that Singapore’s new business class seems like more of an evolution of their current seat rather than a revolution. It’s interesting to note that their new seat is significantly more dense than their old one — they’re fitting 78 business class seats in the same space that was previously occupied by 66 seats. Apparently this is possible without compromising personal space due to the use of new carbon fiber materials. The seat looks reasonably private, and at first glance I’m impressed by the placement of buttons, storage compartments, etc. The other awesome feature is that the two center seats can be turned into double beds. However, what I find annoying is that the area for your feet is still only a small “hole” at the side of your seat, so you’ll continue to have to sleep at a strange angle. I find this to be such a silly design, and I’m sad to see they’re continuing with it. It’s especially odd in the context of a double bed — you can sleep next to one another, but your bodies will have to be positioned in such a way that you can’t really sleep together. So this is sure to be an all around solid product. Singapore has incredible inflight service and catering, and flying them is always a treat. These seats look private, and the double bed concept is cool. Maybe it’s just that the competition has caught up, but it used to be that Singapore Airlines was the #1 innovator in the industry, and given that they’ve supposedly been working on this product for years, I was hoping they’d blow us away. To me this looks good, but not amazing. 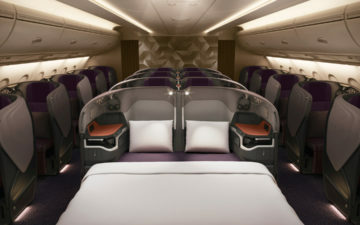 What do you make of Singapore’s new A380 business class? I think the double bed option for the middle seats in business class is very innovative, as well as having enough space to put both of your carry on bags under your seat. I actually really like the existing seat, and this seams to fix the problems with the current seat. Yes, we won’t know until we actually sit on the seat or sleep on it, but I think that having a double bed option for couples will be a huge draw and very popular given that this was previously only an option in their suites. They look really narrow and ugly add this to the fact that the foot well is to the side of the seat and I think that it will end up being terribly uncomfortable. The seats don’t even have armrests. Very interesting. It seems like the industry’s approach to business class is diverging: Qatar has gone with more privacy, while Singapore is leading the charge for open plan. Maybe it’s also a reflection on the relative (un)importance of First to the two operators, too. I hate other people, so I’m with Qatar. Who wants to sleep together in an business seat with no privacy? @SK, with the current business class seat, the bulkheads are the only ones that won’t put your feet in that awkward cubbyhole. I haven’t read everything about the new business class seat yet but is there a bar at the back of the upper deck? I was hoping SQ would add one to keep up with the competition especially since the entire upper deck is either F or J.
AusBT states that the double beds will only be at the bulkheads. Not sure if this has changed in the meantime, but this means that those seated in seats capable of folding out into double beds will actually get to spoon. Disappointing. The seats actually look really narrow and that raised console to the side will be taking a lot of elbows. And I don’t really understand how they can be fully forward facing biz class seats with flat beds in a non-staggered configuration, the footwell is still off to the side still. this business class is more functional with better layout for passanger than first class….. I am surprised that SQ had not attempted to stagger the J seats. Supposedly that could have resolved the awkward sleeping posture and potentially fitting more seats in the same floor space. Ok a way SQ has to make this J product evolutionary rather than revolutionary. Because the backbone of SQ’s fleet will still be 77W and A350. The A380 will only be for a few premium route, and even amongst these routes, they can’t service A380 for all the flights (think SYD and LHR, still has 50% of the flights served by 77W). Their new J on 77W and A350 are still pretty new (<2 years) and it would be very stupid for them to tear them away and install an revolutionary new J seat, when the current J is still pretty good compare to the average J seats with other airlines. One great feature with this new J though, is that the seats recline into a bed, rather then flip into a bed. As others pointed out, it seems that only the 3 sets of middle bulkhead seats can be transformed into a double bed. The non-bulkhead ones – again, apparently – can’t do that. I think it would also very awkward to sleep in a double bed with no doors or privacy… that’s super weird! If the double beds are only at the bulkhead, I wonder if they will charge a premium for those seats, since it sounds like those seats will have a lot more space. Or if not, they’ll almost certainly see those seats get booked up first — and perhaps by non-couples travelers who want the extra foot room while sleeping but intend to raise the privacy partition. I have to agree with all the comments regarding the double bed with no privacy. Why would anyone ever want that? @CR – The seats do indeed face fully forward, but when you turn it into a bed you’re not parallel to the aisle, instead you’re angled so that your feet (which are basically next to the seat in front) are closer to the aisle than your head; this is how they get a fully flat bed into a seat with a 50-inch pitch. Having flown the older version of this, I can say that it works, and while back in 2007 this truly was an amazing product that surpassed most F seats at the time, it’s no longer the best. At first glance seeing the double bed had me quite elated. Especially since getting SQ FC awards has become rather difficult, and the new reduced FC cabin will obviously make that situation much worse. Then I realized these are not closed suites, but rather almost completely open to the aisle. Maybe it’s just because of unfairly high expectations we all had for these products, but I almost feel like both the new business and suites class were lateral moves rather than significant upgrades. With all the criticism of SQ’s business class seat due to the angle at which you sleep — isn’t it exactly the same as with herring bone and reverse herring bone seat, just with more space at the shoulders? With any herring bone layout you’re sleeping at an angle, with less space. I don’t get the outrage, I’ve always gotten great sleep on both of the latest versions of the seat. I’m definitely not an SQ fanboy, actually I found the old Suites way overhyped because of the novelty and have been actively avoiding flying F on the A380. With the food being subpar and service hit and miss, I’m failing to understand the hype around SQ, however I think the outrage regarding the J seat is unjustified. Tweeted at you last night, I think the SQ seats look pretty amazing. Obviously the suites do, but I actually like the look of the Biz Class seats as well. You’d prefer a bit more privacy, but I’d happily fly it. I have never flown SQ, however, and don’t anticipate I ever will. At least, not until they are able to extend their range with the more fuel efficient fleet. I think I have to add at least 1 stop to any destination if I want to fly them. So, it’ll just be fun to look at for now. @02nz – that’s what I was thinking but I thought I had seen a picture where the bed was “straight.” (maybe it was the one from the bulkhead and I’m mistaken). Part of Singapore ‘s problem is their desire to create products from scratch instead of buying one of the solutions from the major manufacturers which have been tested and retested a bunch for optimization and eliminating oddities. I cannot understand for the life of me why Singapore Airlines has now done three versions of this seat and continues to do an off-center footwell. And I’ve never understood the drink holder in the shell in the seat in front of you which means you have to make an effort to lean forward to get it. Do they not focus group these seats? They are their own worst enemy sometimes. Such a shame. Lucky, I totally disagree about the angle thing. It’s only odd if you think that you’re supposed to be lying down in the same position as you sit. When you sit in reverse-herringbone seats, you don’t complain about the “odd angle” you have to lie down in. After flipping the current seat over to the bed position, you find that even the seat belt is angled to show you how you’re meant to sleep. I’m 6’2″ and I didn’t find it at all like some of the tatl seats where you really have to contort yourself to fit your feet in the designated cubbyhole. My biggest complain about seats like on AA and CX is that when reclined in the flat bed position, you still have these odd bulges in the seat that are meant to provide support and comfort when sitting up, but are just in the way for a side or stomach sleeper. Honestly do people really want a double bed. When I travel with my wife we have different flight patterns. If one person wakes up and wants to sit up right the other person will have to wake up. You will also have to go to bed at the same time or it will disturb your mate. I prefer a single bed and to just do my own thing. I’m most shocked about the window seats. You think it would be flipped so the seat is closer to the window. Doesn’t look like you can even see out the window. I don’t look at this business seat and see something amazing but it’s definitely very competitive. From other reports I’ve read, it seems the new business class seats will also be on the A350 ULR, scheduled for some time in 2018 for LAX and JFK. I’m not sure why people are complaining about the lack of privacy in a business class double bed. The goal here is not that you can bang your wife in J. Get over it people. Do you think others are interested in what you’re doing? These seats look really cramped in he pictures and in video, compared to the previous A380 J seats. When I checked it out on seatguru it seems that SQ has shaved 5 inches in pitch and then 5 inches in width? It’s even narrower than the SQ A350 J seats. This privacy talk is nonsense, in the end you are voluntarily sitting with 300-400 people in a tube. If you want privacy use your private jet. However I do think the BC is a failure. I have never found the old seats comfortable and it seems the new ones are equally uncomfortable. I think it’s a good refresh overall, and that there are more business class seats soon hopefully means better availability for redemptions. Something about that open double bed in J is creepy. I figured SQ would come up with something sterile and pragmatic, and they delivered, I guess. My personal preferences would have been for enclosed suites like QR or DL, or at the very least, some refined touches like the side light in the Etihad business studio. We are booked on SQ 25 in May 2018 and hold J awards in 18D, F. Do you believe that this route will be next after LHR to receive a new A380? We would love to try out the new double bed in J, if our Suite waitlists don’t clear. If the A380 gets swapped to the new configuration, will the bulkhead partitions remain at the same places? 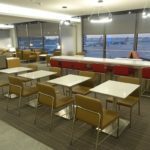 Our goal would be for seats 18D, F to automatically become seats 11D, F on the new configuration when SQ’s computer reassigns seats do to equipment change. I will be intrigued to see how the new business class compares to the old, which I found to be very comfortable, but a little dated in design. Not sure about the new ‘narrow’ seats in BC but they are still a generous 25″ wide which should be more than adequate. I also note the lack of armrest, but again, until I try them it is difficult to comment. For me, the most important part is how comfortable they are to sleep in, as I will be flying from London to Auckland with just a quick off in Changi. For me, comfort sleeping and dozing is paramount on such long flights. I quite like the look of the new First suites and might upgrade on the way down, as having flown down last time First with my wife, the double bed was extremely comfortable although we appreciated the privacy of the closing doors on the suites. Not sure if the new Suites have a closing door, but with just 6 suites its hardly going to be likely many folk will be passing by. Looking forward to flying with SIA as their level of service and detail is much better than say, Emirates, who we flew with many times on the same route, both First and BC. 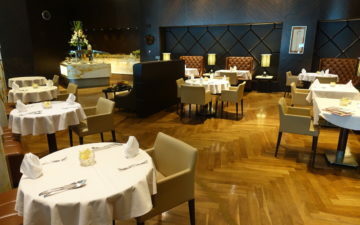 I find them more ‘low key’ and discreet than the sometimes garish Emirates, and the cuisine and wines are extremely good too. 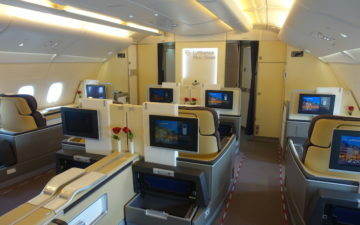 I flew in this business class seat yesterday HK to Singapore. A huge improvement on the current seat, and really liked it. Don’t see the point AT ALL in the double bed concept. I prefer it to the Emirates A380 business class seat (the mini bar is silly.) I like the Qatar business class seat on the A350 but don’t love it. No privacy at all which I don’t like when I want to sleep. And particularly don’t like seeing everyone’s heads because the shell is quite low. Having said that, it is the most comfortable business class seat. Couldn’t agree more!! I just tried the window seat on this new business class last week from Syd to Sin. I just found that the previous business class seats on the A350 and 773ER are much better and comfy. Gonna try their HK-Sin route today though. I hope that it’s gonna be better.